The snowstorm that recently hit the East Coast, nicknamed Jonas, caused a lot of disruptions and inconvenience to businesses over the weekend, especially to those in the transportation industry. However, most experts have said the overall economic impact is still unclear. Weather Co. Vice President of Weather Analytics Paul Walsh told The Wall Street Journal that he estimates at least $500 million in productivity was lost over a 48-hour span. He also said that transportation and travel companies lost a weekend's worth of business and, although retail sales suffered, it is also probable that some stores saw increases from people preparing for the blizzard. Recovering from supply chain disruptions can be a lengthy process. Airports need to ensure all the snow is removed, not only from the runways but from the streets people take to get there as well. The United States Environmental Protection Agency said the U.S. Global Change Research Program found that some of the major airports throughout the country "are located in low-lying coastal areas, making them particularly vulnerable to inundation. For example, in the tri-state area of New York, New Jersey and Connecticut, many critical transportation infrastructure facilities (including Newark and LaGuardia airports) lie within the range of current and projected 50-year coastal storm surges." The Wall Street Journal reported that, according to FlightAware, airlines were forced to cancel more than 12,000 flights between Friday and Tuesday. Global Eagle Entertainment Inc. Senior Vice President of Operations Solutions Josh Marks told the source that while in a recovery period, air carriers will likely prioritize international flights over domestics ones. 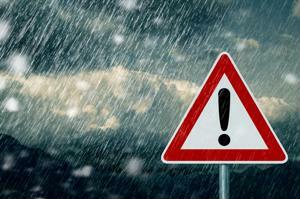 In an article for Supply Chain 24/7, Peter Goldstein pointed out that bad weather can be especially problematic for shippers and transportation companies. "Trucks get stuck on congested, unplowed highways. Railroads can't clear snow from the tracks fast enough for trains to get through. Snow and ice made it impossible for planes to safely land and take off. Like dominoes, one delay leads to another, disrupting supply chains across the country," he explained. Unfortunately, harsh weather conditions and natural disasters are some of the biggest threats to supply chains, which is why it is so important companies have a comprehensive risk management and recovery plan in place. To minimize the negative effect weather has on business, Goldstein emphasized the importance of preparing for such disruptions ahead of time and highlighted some essential tips for supply chain managers. In his suggestions, Goldstein said executives should execute an annual procurement assessment to evaluate existing providers and rates, measure the freight volumes carriers handle before agreeing to work with them and follow market trends to be aware of any negative effects economic shifts could have on transportation costs. He also noted that it is imperative for supply chain leaders to identify budget for transportation operations. C.H. Robinson recently published a white paper that said it is essential that companies utilize different methods of transporting materials and leverage a variety of logistics providers. In addition, executives should consider the tradeoffs of each type of transit carrier. For example, although it may be more expensive to have marine freight shippers transport products directly to a terminal, it speeds up delivery times. The source pointed out that, in the event of disruption, corporations should assess which loads need to be expedited and which can wait, then distribute the deliveries through the most cost-effective channels for each. It also explained that creating a resilient supply chain is more efficient with the help of a global transportation management system and a third-party firm that specializes in strategic supply chain and logistics solutions.